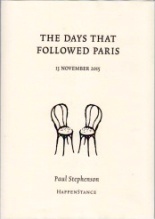 Paul Stephenson was living in Paris for three years, which included the night of 13h November 2015 when terror struck the city. A series of co-ordinated terrorist attacks plunged the city into chaos and fear. Stephenson was at home at the time but witnessed the aftermath of the event and saw how it affected the lives of ordinary people. by the Paris Terror Attacks. that the one who prevented the suicide bomber was actually Muslim. We watch everything. Watch everything LIVE. Life is a series of updates. A halt on the living. In this twenty-first century nearly all of us are suspicious. We are told to be on the alert for terrorism. There is no escape from how the world is now. It’s the truthfulness in these poems that make them so compelling to read and also in a peculiar way they are reassuring. The world is the same all over. It is all right for us to feel as we feel – suspicious, sometimes crazy with fear for loved ones. taking line seven to Gare de l’Est. The form of the poems adds another dimension to the content. Each poem is laid out differently, there is no conformity just as there is no conformity in life. I found one of the most moving poems to be ‘Public Names’, which is a list of 126 names of the people killed in the attack. Some people chose not to reveal the identity of their son or daughter. I heard Stephenson read this poem and it was moving just listening to the names and I think because these people had just been a statistic to me until then. This is a very fine collection of poems and an apt memorial to those who lost their lives in this terrorist attack in Paris. As fellow citizens we owe it to them to have this chapbook on our book shelves. We take in the bang. Await the all-clear. Pull-out, pick up speed, miss connections.